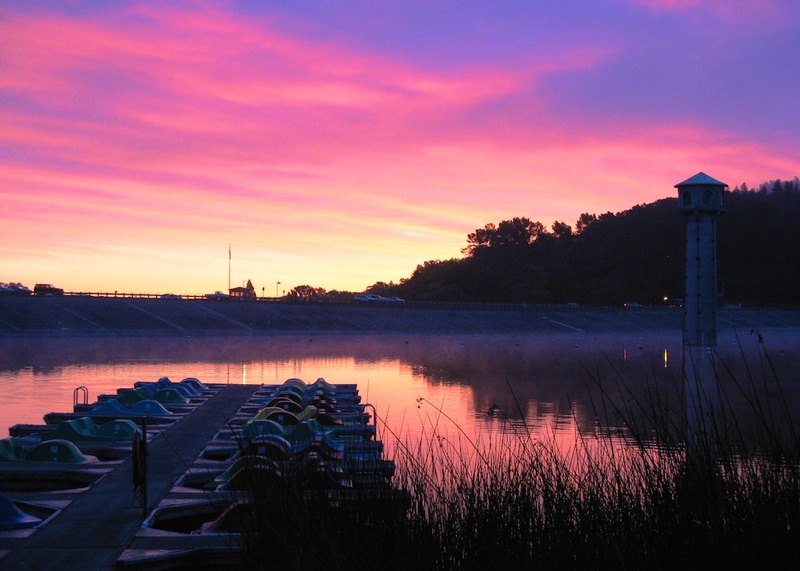 East Bay Municipal Utilities District (EBMUD) is the public utility that supplies our water in the East Bay. To accomplish that task, EBMUD manages thousands of acres of watershed land. Like most open space in the Bay Area, the vegetation on EBMUD’s land is a mix of native and non-native species. EBMUD is revising its Master Plan. The draft Master Plan renews its commitment to destroying all eucalyptus and Monterey pines in favor of native vegetation. The draft Master Plan is available HERE. EBMUD is accepting written public comments on the draft Master Plan until September 2 extended to Friday, September 16, 2106. Comments should be sent to watershedmasterplan@ebmud.com or by mail to Doug Wallace, EBMUD, 375 11th St, Oakland, CA 94607. EBMUD held a public meeting about its draft Master Plan on Monday, August 15, 2016. That meeting was attended by over 200 people. Most of the crowd seemed to be there to defend their access to EBMUD trails by bicycles. There were 10 speakers who defended our trees against pointless destruction and the consequent pesticide use to prevent their resprouting. As usual, the Sierra Club came to object to increased access for bicycles and to demand the eradication of our trees. As usual, claims of extreme flammability of non-native trees was their stated reason for demanding the destruction of the trees. Update: HERE is a video of speakers at the EBMUD meeting for and against tree destruction and pesticide use. If you are watching the news, you know that there are now eight wildfires raging in California. All of these wildfires are occurring in native vegetation. The claim that non-native trees are more flammable than native trees and vegetation is nativist propaganda. Furthermore, our native trees are dying of drought and disease. This article in the East Bay Times informs us that 70 million native trees have died in the past four drought years and that the millions of dead trees have substantially increased fire hazards. In other words, it is profoundly stupid to destroy healthy, living trees at a time when our native trees are dying and pose a greater fire hazard. We are grateful to Save the East Bay Hills for permitting us to publish their excellent letter to EBMUD about their misguided plans to destroy our urban forest. We hope that their letter will inspire others to write their own letters to EBMUD by September 2, 2016. 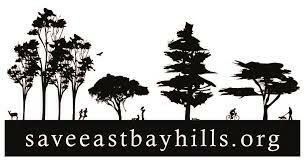 Save the East Bay Hills is a reliable source of information about our issue. Thank you, Save the East Bay Hills for all you do to defend our urban forest against pointless destruction. Update: Save the East Bay Hills has also created a petition to EBMUD that we hope you will sign and share with others. The petition is available HERE. This letter serves as our response to the East Bay Municipal Utility District’s invitation for the public to review and comment on the draft of the East Bay Watershed Master Plan (“Draft Master Plan”) update. There is much in the plan to recommend itself and much that leaves a lot to be desired. Finally, it recognizes that these tall trees occupy a very small portion of District lands: 1% for Eucalyptus and 2% for Monterey Pines. Given their immense beauty, the habitat they provide, their mitigation against fire, the erosion control, all the other recognized benefits, and the fact that they occupy such a small percentage of overall District lands, why does the Draft Master Plan propose that they be eradicated over time? This is a misreading of the public will. The Draft Master Plan is elevating the nativist agenda of a loud, vocal minority over good sense, good science, ecological benefit, protection against fire, and the desires of the vast majority of residents and users of District lands. How do we know? The City of Oakland, the University of California, and the East Bay Regional Park District have also proposed eradicating Monterey Pine and Eucalyptus trees and of the 13,000 comments received by FEMA during the public comment period following its draft plan, roughly 90% were in opposition by FEMA’s own admission. Moreover, over 65,000 people have petitioned the City of Oakland to abandon its effort to remove the trees. That EBMUD does not hear from people who find beauty, shade, and benefit in the trees is not because they do not care; rather, it is because most members of the public do not understand the extent to which these trees are under siege by nativists, nor the level of cooperation these individuals are receiving from public lands managers to see their vision prevail. For most members of the public, it simply strains credulity that those tasked with overseeing our public lands would cooperate with efforts to destroy not only large numbers of perfectly healthy trees, but given their height and beauty, trees that are the most responsible for the iconic character of East Bay public lands and the appeal of our most beloved hiking trails. And for what end? To treat our public lands as the personal, native plant gardens of those who subscribe to such narrow views. In short, there is no widespread desire to get rid of these trees and they should not be removed. Indeed, the Draft Master Plan recognizes several “emerging challenges” as a result of climate change including, but not limited to, “increasing average temperatures, prolonged droughts, erosion, decreased soil moisture, and augmented risk of fires.” Tall trees like Eucalyptus and Monterey Pine help mitigate these challenges. For example, fog drip falling from Monterey Pines in the East Bay has been measured at over 10 inches per year. In San Francisco, fog drip in the Eucalyptus forest was measured at over 16 inches per year. Moreover, Eucalyptus trees are an important nesting site for hawks, owls and other birds and are one of the few sources of nectar for Northern California bees in the winter. Over 100 species of birds use Eucalyptus trees as habitat, Monarch butterflies depend on Eucalyptus during the winter, and Eucalyptus trees increase biodiversity. A 1990 survey in Tilden Park found 38 different species beneath the main canopy of Eucalyptus forests, compared to only 18 in Oak woodlands. They also prevent soil erosion in the hills, trap particulate pollution all year around, and sequester carbon. Many of these benefits are especially important in light of Sudden Oak Death which the Draft Master Plan admits is an ongoing challenge and is likely to increase because of climate change. If Sudden Oak Death impacts oak woodlands and EBMUD intentionally cuts down Eucalyptus and Monterey Pine which are proving themselves more suitable for the environment, it risks a treeless landscape, which would not only be a loss of beauty and loss of wildlife habitat, but exacerbate the challenges already faced by EBMUD as a result of climate change. We also object to the Draft Master Plan accepting the labels “native” and “non-native” and making decisions based on that fact alone. “Non-native” and “invasive species” are terms that have entered the lexicon of popular culture and become pejorative, inspiring unwarranted fear, knee-jerk suspicion, and a lack of thoughtfulness and moral consideration. They are language of intolerance, based on an idea we have thoroughly rejected in our treatment of our fellow human beings — that the value of a living being can be reduced merely to its place of ancestral origin. This never-ending transformation — of landscape, of climate, of plants and animals — has occurred, and continues to occur, all over the world, resulting from a variety of factors: global weather patterns, plate tectonics, evolution, natural selection, migration, and even the devastating effects of impacting asteroids. The geographic and fossil records tell us that there is but one constant to life on Earth, and that is change. Even if one were to accept that the terms “native” and “non-native” have value, however, not only do they not make sense as it relates to Monterey Pine and Eucalyptus, but the outcome would not change for three reasons. First, Monterey Pine and Eucalyptus provide numerous tangible benefits as previously discussed, while the claimed “problem” of their foreign antecedents is entirely intangible. That a plant or animal, including the millions of humans now residing in North America, may be “non-native” is a distinction without any practical relevance beyond the consternation such labels may inspire in those most prone to intolerance; individuals, it often seems, who demand that our collectively owned lands be forced to comply to their rigid and exiguous view of the natural world. What does it matter where these trees once originated if they provide such tremendous beauty and benefit here and now? Second, the fossil record demonstrates that Monterey Pine are, in fact, “native” to the East Bay. (See, e.g., http://evolution.berkeley.edu/evolibrary/article/montereypines_01.) Monterey Pine fossils from the middle Miocene through the Pleistocene have been found in several East Bay locations. Similarly, since Eucalyptus readily hybridizes with other species, many experts now claim that California Eucalyptus hybrids could rightly be considered native, too. As tree lovers and environmentalists in Cambria are banding together to determine how, if at all, they can save their precious remaining Monterey Pines now dying from drought in record numbers, here in the East Bay – less than 224 miles away – land managers at EBMUD are considering plans to willfully destroy them in record numbers. It is ecologically irresponsible and for those of us who dearly love the stunning, even arresting, beauty of these trees, it is also truly heartbreaking. For all these reasons, we oppose the elimination of Monterey Pine and Eucalyptus, even if phased over time as proposed, and likewise oppose EBMUD’s participation in the destruction of similar Pine and Eucalyptus forests in the Caldecott Tunnel area, in partnership with outside agencies. We ask that these be stricken from the Master Plan. ● Extremely low levels of pesticide exposure can cause significant health harms, particularly during pregnancy and early childhood. ● Children are more susceptible to hazardous impacts from pesticides than are adults and compelling evidence links pesticide exposures with harms to the structure and functioning of the brain and nervous system and are clearly implicated as contributors to the rising rates of attention deficit/hyperactivity disorder, widespread declines in IQ, and other measures of cognitive function. ● Cancer rates among children are increasing at an alarming rate and pesticide exposure contributes to childhood cancer, as well as other increasingly common negative health outcomes such as birth defects and early puberty. ● Approximately 4,800,000 children in the United States under the age of 18 have asthma, the most common chronic illness in children, and the incidence of asthma is on the rise. Emergence science suggests that pesticides may be important contributors to the current epidemic of childhood asthma. ● Animals, including wildlife and pets, are at great risk from exposure to pesticides, including lethargy, excessive salivation, liver damage, blindness, seizures, cancer, and premature death. ● Pesticides contain toxic substances, many of which have a detrimental effect on animal health, including pets, raptors, deer, and other wildlife, which is compounded when the bodies of poisoned animals are ingested by subsequent animals. ● The U.S. Environmental Protection Agency has recommended non-chemical approaches, such as sanitation and maintenance. These concerns are compounded by the fact that pesticides are to be administered near reservoirs, threatening the safety and integrity of our water supply and the water supply of the plants and animals who also depend on it. These reasons are why the Marin Municipal Water District removed the use of herbicides from further consideration in its Draft Plan and maintained the pesticide ban it has had in place for several years. Pesticides are not only dangerous, they are also incredibly cruel. Rodenticides, for example, are opposed by every animal protection group in the nation because not only do they kill animals, but they do so in one of the cruelest and most prolonged ways possible, causing anywhere from four to seven days of suffering before an animal finally comes to the massive internal bleeding these poisons facilitate. This long sickness period often includes abnormal breathing, diarrhea, shivering and trembling, external bleeding and spasms, suffering and death that is perpetuated when their dead bodies are ingested by subsequent animals, such as owls and raptors. Put simply, EBMUD should not be in the business of targeting any healthy animals, trees, and plants for elimination; and doing so by pesticides harms animals well beyond the target species, including humans. In summary, public agencies overseeing public lands have a responsibility to minimize harm and reject radical transformations of those lands and the ecosystems they contain, especially in absence of any clear public mandate. Not only have these lands been handed down in trust from prior generations for us to enjoy, preserve, and bequeath to future generations, but there is a reasonable expectation on the part of most citizens that those overseeing our collectively owned lands not undertake agendas to destroy large numbers of healthy trees, kill healthy animals, and poison our environment. Regardless of how Eucalyptus and Monterey Pine trees may be maligned by the extreme few, they are beloved by the many, being in large part responsible for the East Bay’s beauty, iconic character and treasured, shady walking trails and picnic areas. In the case of EBMUD, this orientation is even more alarming and a violation of the public trust because it elevates the ideological driven, nativist agenda of the few above the agency’s primary mandate and interests of the many: ensuring the integrity and safety of our water supply and the plants and animals who reside there. Adopting plans to alter pre-existing landscapes through the use of toxic pesticides in order to placate unreasonable and xenophobic demands on lands that contain the public’s precious reserves of drinking water is a deep inversion of priorities. We respectfully request that these proposed ends and means be stricken from the Master Plan. 3) Recognize that demands for eradication of eucalyptus and pine are from a vocal nativist minority and are not the sentiments of the general public or even the membership of the Sierra Club. A concerted effort to raise fear of the eucs as fire risk extraordinaire has been widely disseminated by nativists; it is best answered with an update of the facts by those scientists and others in a position to know who are not bent toward promoting a nativist agenda. Thank you for attending the public meeting and for the excellent advice about good arguments to defend our trees. Thank you so much for publishing this excellent letter. It’s is horrific we have to keep fighting to save our rare and wonderful wilderness parks right in our cities, with so many trees, other plants and wild animals. So much money is needed for actual emergencies so that makes makes this even more of a travesty. It’s also shocking that these public agencies can do all this without most people knowing and without a vote. Excellent comment by Marla too. I did see them taking notes last night. We must spread the word to everyone we know to write to EBMUD.